Three high quality products bundled together. Intel's 7th generation of processors is here, and although Kaby Lake CPUs can be fairly pricey at the moment, there are decent deals to be found around the Internet. Box.co.uk has a bundle featuring an MSI Z270 Gaming M5 motherboard combined with an Intel Core i5-7600K CPU for £400. This is a only slight saving over how much they can be bought for separately, but while stocks last, you can also grab a free 256GB Intel SSD 600P, sweetening the deal a whole bunch. 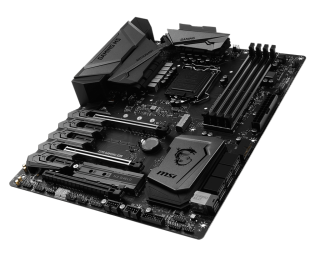 The MSI Z270 Gaming M5 motherboard and the Intel Core i5-7600K processor are fresh out of the blocks, and will provide some serious power for your PC. The 7600K has a base block speed of 3.8Ghz, with a 4.2GHz turbo speed, which means it's the first Core i5 chip to have stock clock speeds which break the 4GHz barrier. It's got decent overclocking potential too, as you can see from our quest for 5GHz in our Kaby Lake overclocking experiment. The Intel 600P is hardly ancient either, as it only released in the middle of last year. It's an M.2 drive too, meaning it delivers high performance, and takes up way less space than your standard SATA SSD. For all three components separately you'll likely be paying around £500, so a saving of £100 while the stocks last on the SSD is not to be sniffed at for brand new hardware. Do bear in mind that you'll need to get yourself a CPU cooler on top of this bundle, but a good cooler won't break the bank.